Harkness Memorial State Park visit. As I work my way through these historic gardens, I find I most like the ones that truly retain the original layouts. What’s that? That’s the point of these things? Oh yeah. I knew that. But how many of them still have original heliotrope planted by Beatrix Ferrand? (I have no idea and maybe some do, but I think it’s pretty cool regardless.) 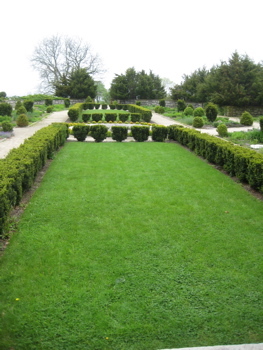 I toured the gardens here as part of a wider tour of the Harkness mansion, but our guide (from the Friends of Harkness group) was very intent on giving us the full garden tour – which I was more than happy with. 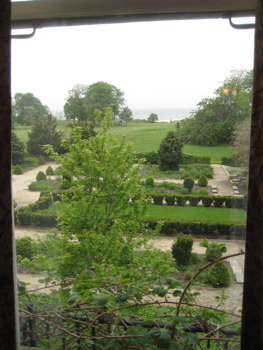 The gardens at Harkness surround a 1906 Roman Renaissance Revival-style mansion once owned by millionaire philanthropists Edward and Mary Harkness. The 200+ acres were a working farm and the mansion (named “Eolia” after the island home of the Greek god of winds) was the Harkness’ summer home. This is supposed to be Mary Harkness’s initials. Seriously. 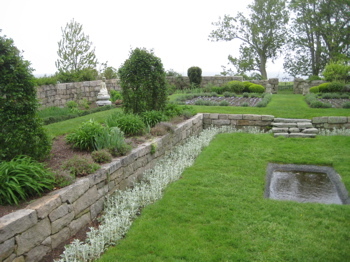 From 1918 to 1929, Beatrix Farrand (landscape designer and one of the founders of the American Society of Landscape Architects) redesigned the West Garden and created and installed the East Garden, the Boxwood Parterre and the Alpine Rock Garden. The garden design combines Farrand’s innovative use of plant material with Mrs. Harkness’ color preferences and extensive collection of Asian garden statuary. 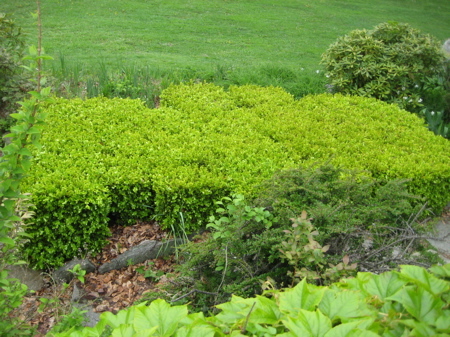 The estate was left to the State of Connecticut in 1950.
everyone wants color. I think it was some sort of impressionistic thing or something. Anyway, beginning in the mid-1990s, extensive restoration work was done on the Mansion and the gardens, and today the property looks much as it did in the 1930s. The gardens that surround the mansion follow the original Farrand plan, and are now fully restored with a loggia, water features, paths, wrought iron fencing, statuary, benches and hundreds of perennials, annuals and shrubs. 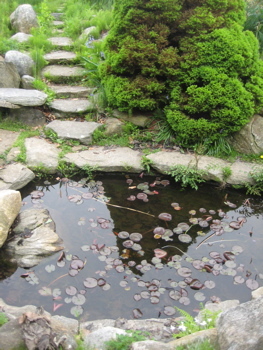 The site also includes dozens of mature beach and maple trees, a cutting garden and a greenhouse. A funny note: that cutting garden has a corresponding Cutting Room in the mansion, which is the size of my kitchen. Just to cut flowers. In all, four fountains in the gardens were restored and repiped. An irrigation system was installed which included new footpath lighting. The roof of the Pergola was rebuilt, the trellis replaced, and columns and floor cleaned and restored. 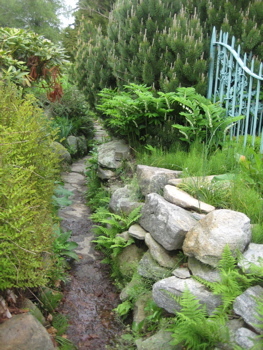 The wrought iron fencing and gates throughout the gardens were restored and the rock garden replanted. There was a time when people thought Harkness was one of only a few surviving original Farrand gardens. 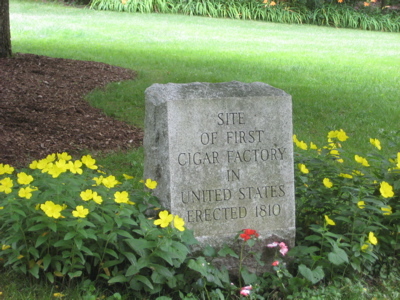 Since then, many have been rediscovered, but they still celebrate it with passion in Waterford.